The May meeting is going to be full of great fun! We are going to have voting (on membership to the MQG, bylaws, and dues. The bylaws to be voted on can be found here), an oven mitt swap, and a program on hand quilting and will be presented by Debby. (optional) Cash or check for $20, as long as all of the bylaws and dues are approved by the group we will be collecting dues in May and June. Note: The June meeting is going to be moved to June 20th due to a conflict with the Landrum Quilt Guild quilt show. Location TBD. I hope to see you all then! (If you have any questions, you can e-mail me at cheryljbrickey (at ) gmail (dot) com or leave a comment on this post). President Cheryl Brickey called the meeting to order at 1:00 pm. Eight people were in attendance. Christa's twins, Luke and Liam, are home and growing. The Bernina store has moved and is now under the ownership of Leslie, its new location is 2310-A East North Street. Landrum Quilt Guild’s quilt show will be at the Landrum Middle School on June 11th– 13th. The Modern Quilt Guild is hosting a Riley Blake challenge using The Cottage Garden fabric collection. The due date for the challenge is late July. 1. Make something fantastic that is quilted. 2. Make something you have never done before. 3. Challenge yourself to learn something new. Darlene is leading our philanthropy. We are going to create a lap size quilt that will be auctioned at a silent auction at a December 2nd fundraiser for the Meyer Center. The goal is to have all of the blocks for the quilt complete by August and to arrange the blocks into a quilt top design at the August meeting. Darleen volunteered to piece the blocks into a quilt top and supply the batting. Fannie has volunteered to quilt the quilt. Lucy has selected a wonky star for this month’s block of the month (BOM). 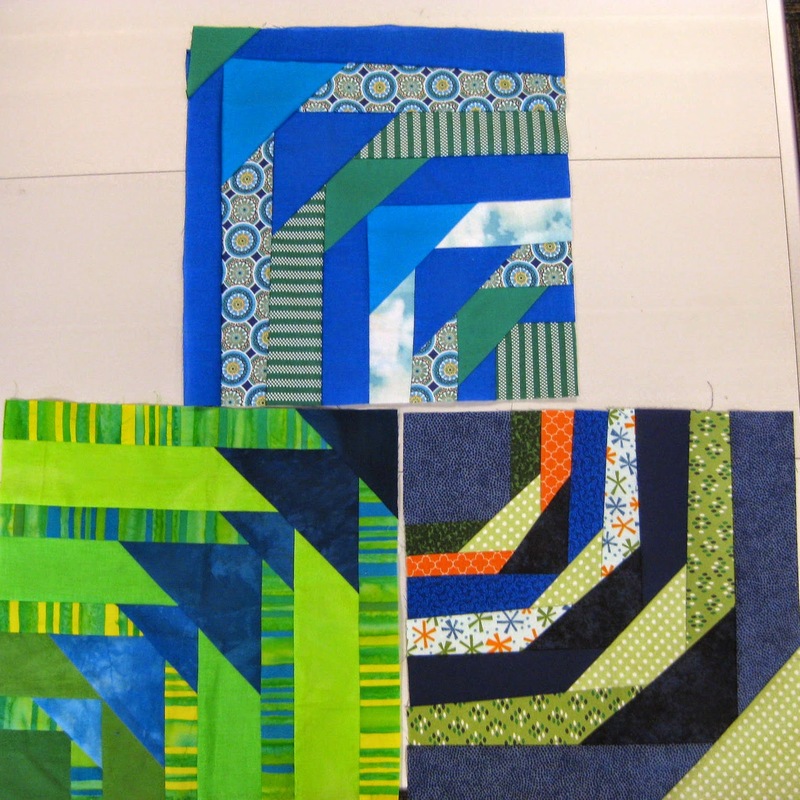 Please make your blocks using blues and greens so that these blocks can be combined with the previous month’s blocks for the philanthropy quilt. If you have not made last month’s BOM, you can still make one and bring it to the May meeting. Here are the blocks turned in for last month’s block of the month. The oven mitt swap will be in May – if you bring one, you get to take one home. Marilyn prepped and lead the discussion of the draft by-laws. Thank you to Paige and Cheryl for providing some QuiltCon swag so that every attendee won at least 2 items. A copy of the amended draft of the by-laws can be found here. Please review these by-laws and send any comments or suggestions to Cheryl (cheryljbrickey(at)gmail(dot)com) no later than Thursday, April 23rd. The by-laws to be voted on will be posted to the website on Saturday, April 25th (2 weeks before the May meeting). 1. Should we, as The Guild, join the Modern Quilt Guild? 2. Do we approve the by-laws? 3. Do we approve the following dues? 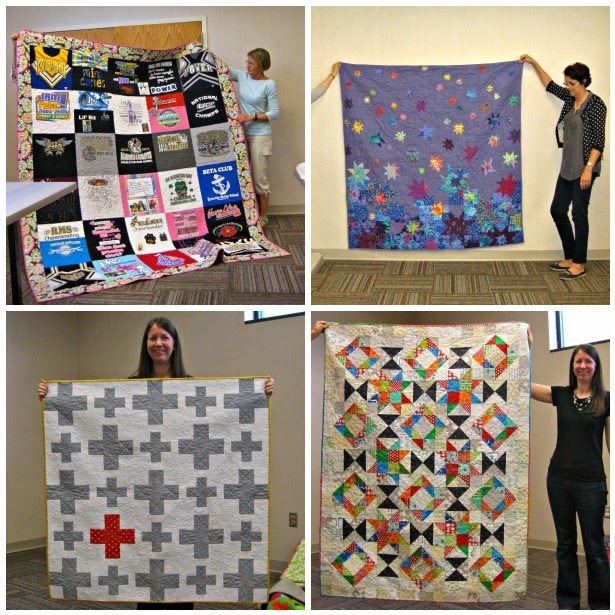 May 9th @ Taylors Library: Big stitch hand quilting by Debby West. Information and supply list will be in a later post. By-laws voting and oven mitt swap. June 13th @ Taylors Library: (we are trying to move this meeting due to the Landrum Quilt Show) Fabric dyeing and surface printing by Faye. July 11th @ Taylors Library: Quilt show quilt preparation and binding techniques by Paige. Riley Blake Challenge reveal. Copy of the draft by-laws (available here). We will have some copies of the by-laws for people to share. EDITED April 5: I apologize to everyone that tried to access the by-laws and could not. This was my first time using Google Docs and did not realize that I had to set permissions for the document. The link should work now, if you have any problems, email me at cheryljbrickey (at) gmail (dot) com. Please also remember to bring your show and shares!